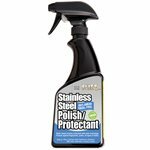 This powerful cleaner and de-greaser easily removes grease, oil, waterspots, fingerprints, wax, body oil, lotions, soap, nicotine and more, making it the ideal choice for any stainless steel or chrome surface. Just spray and wipe this 16oz. water-based stainless steel and chrome cleaner for outstanding streak-free results. Works great for a variety of applications such as auto/truck, marine, kitchen and BBQ's. 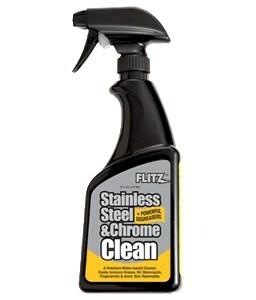 For a polished look, follow Flitz Stainless Steel and Chrome Cleaner with Flitz Stainless Steel & Chrome Polish. Won't discolor stainless steel. Not for use on aluminum. Non-flammable.